Florida’s Citizens Property Insurance Corporation is set to buy a larger reinsurance program for 2019 as it adds $200 million of coverage for non-coastal residential properties its covers following increasing losses from hurricanes, non-weather water-loss claims, litigation and assignment of benefits abuse. In the past Citizens has only purchased reinsurance and catastrophe bonds for its coastal account, where the most wind and surge exposed property stock sits within its portfolio. 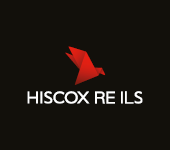 But as claims for inland homes have risen so significantly, following hurricane Irma in particular, Florida Citizens is to buy reinsurance limit for its Personal Lines Account (PLA) for the first time in its history. It’s a recognition that the exposure to storm risk away from the coast is still significant, but also that issues related to non-weather water loss claims, litigation and of course assignment of benefits (AOB) are not only restricted to coastal areas of Florida. In fact, claims inflation away from the coast can be even more costly for Citizens, we’d imagine, as these properties likely haven’t been paying as high a rate for their insurance in the first place. Citizens raised its insurance rates in the state of Florida last year specifically because of the surge of non-weather water and AOB cases. Further rate rises may now be required, as risk transfer costs are increased to protect the insurers surplus against these issues. Meaning that when claims and claim inflation emerges due to non-weather water and AOB related issues, it can be perhaps more detrimental to the Citizens surplus, deserving of protection. Since 2015, Citizens PLA segment has operated at a loss. In recent years the claims from hurricanes Irma and Michael, as well as non-weather-related water claims, assignment of benefits abuse and increased litigation have driven the loss and in 2018, the net loss for the PLA reached $135.9 million. So Florida Citizens will buy an added $200 million of reinsurance for the Personal Lines Account (PLA) this year in the run up to its June renewal. The Personal Lines Account (PLA) consists of 301,000 residential policies, most of which are located away from the coast. As a result of buying the $200 million of reinsurance, Citizens’ PLA surplus exposure will be reduced from 62% to 52% should a 1-100 year storm occur. “After significant losses in the Personal Lines Account from Hurricanes Irma and Michael, along with nonweather losses and assignment of benefits, the Personal Lines Account surplus has decreased significantly and is now exposing much more of its surplus for a 1-100 year storm,” Jennifer Montero, Citizens Chief Financial Officer, explained to the Board of Governors on Wednesday. 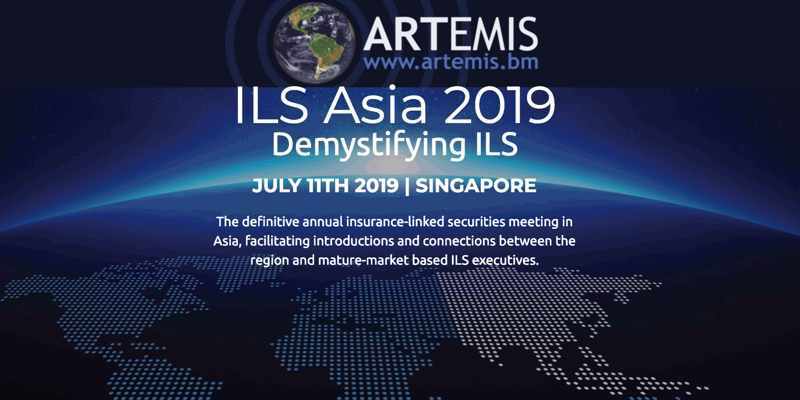 Citizens says it is to buy “traditional” reinsurance for this added $200 million layer, but that does not mean that ILS capital will not be involved. That just means it won’t be a catastrophe bond, but collateralized and fronted participation from ILS funds are expected to feature. This new $200 million layer, which will provide aggregate reinsurance protection, will be positioned alongside and wrapping over the top of the Florida Hurricane Catastrophe Fund (FHCF) coverage that Citizens buys for the PLA (shown below). Including the PLA reinsurance layer, Florida Citizens now aims to have in place a $1.6 billion program of reinsurance and catastrophe bonds for the 2019 hurricane season. The Florida Citizens Coastal Account will have roughly $1.4 billion in coverage, which includes $880 million in traditional reinsurance and catastrophe bonds that are still in-force from purchases made in 2017 and 2018. 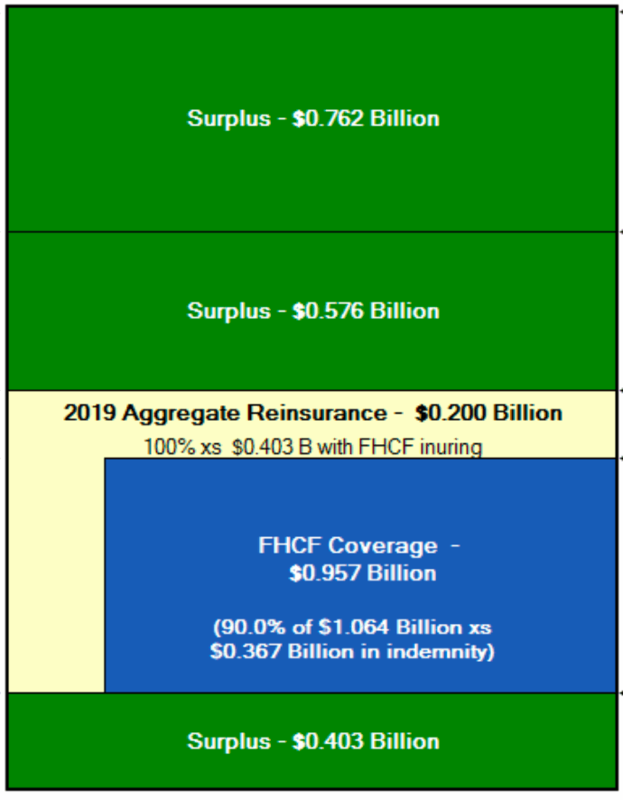 Citizens will be purchasing a new $300 million layer of aggregate reinsurance to sit at the top of its Coastal Account tower, as well as a sliver of around $148 million of per-occurrence reinsurance to sit alongside the FHCF coverage for this account (shown below). 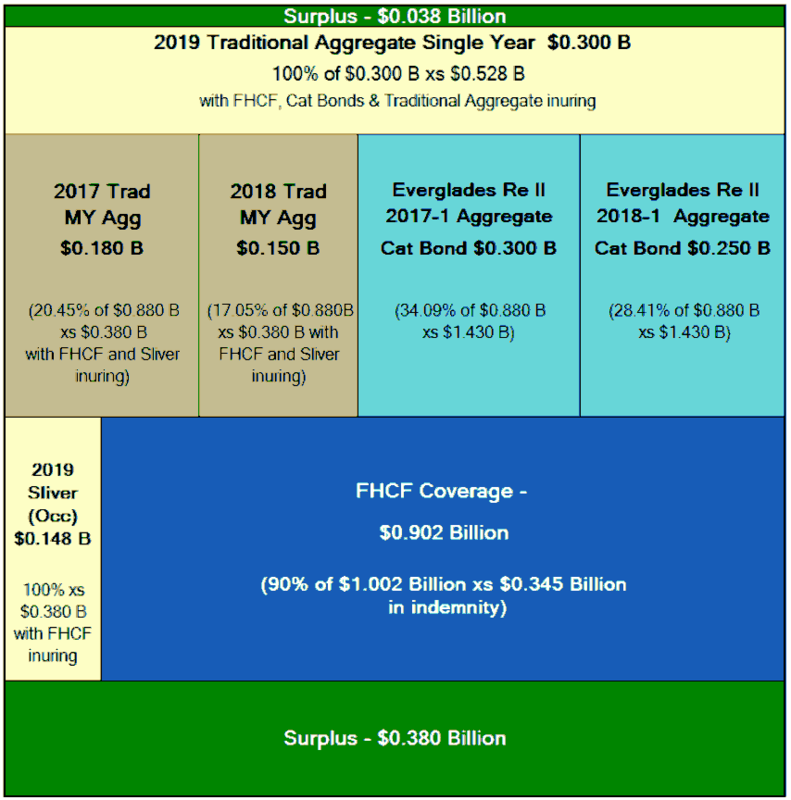 As a result, it does not look like Florida Citizens will bring any new catastrophe bonds in 2019, but with a chunk of multi-year cat bonds and reinsurance due to expire before the 2020 hurricane season we could see Citizens back in the capital markets with a new Everglades cat bond next year, we’d imagine. The additional reinsurance demand being shown by Florida Citizens will be welcomed by reinsurers and ILS funds. Whether other Florida focused primary insurers that cover housing stock away from the coast may need to buy more reinsurance as well remains to be seen. But as long as the litigation crisis continues in the state, it is almost certain that claims escalation will persist and gradually insurers operating there will seek better coverage.